Simply interacting with art can free it from high-minded irrelevance, and bring it into the lives of everyday people -- the very people who consider it hilarious to pose for photos positioned as though they're cupping David's tiny wang. For art you can interact with daily, grab some kicks from ALIVESHOES. 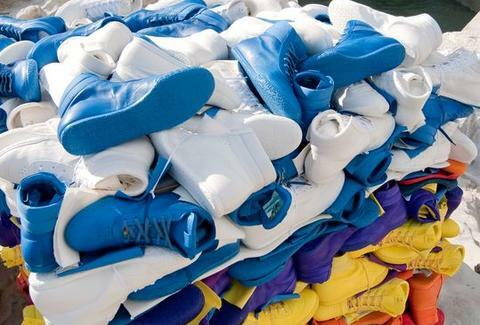 A project from a worldwide coterie of shoe-loving artists/designers, ALIVE enlists a melange of global art-makers to use their monochromatic hi-tops as the medium for their work (sculptures, large gallery installations, etc. 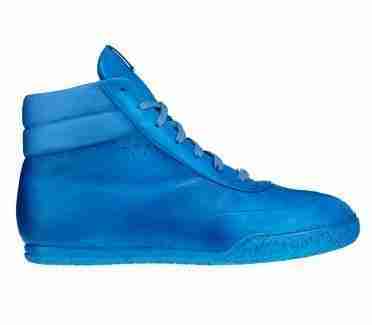 ), then dismantles said projects and sells the component sneaks to the public, like pieces of the True Cross(trainers). Each pair's expertly constructed by "master craftsmen" in Italy using only sustainable materials, including cork/leather/natural cotton uppers, and soles of foam rubber & biodegradable polyurethane, elements so environmentally conscious they claim it's "like wearing nature itself", though it must be even better than that, 'cause Ric's looking pretty wrinkly these days. Each shoe's also hand-colored using environmentally sound dyes (in 11 options, from bright yellow to neon blue), printed with a unique ID number, and features a sketch of the installation it came from stitched under the tongue, increasing the likelihood that Jesse James will bang your shoes instead of his wife. ALIVE even lets you determine your kicks' final price, which starts at a base covering only material costs, but can be built up with contributions to charitable partners & future art projects, though if said project is sneakering David, key indicators suggest he'll need them as small as they come.